Though sometimes invisible, the damage resulting from excessively high winds is often quite easy to see. Modern roof shingles are better designed than their predecessors in terms of wind resistance due to ever-increasing standards and knowledge, but there is often little that can be done to prevent wind damage in the most extreme conditions. 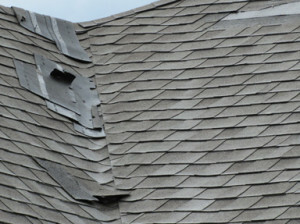 Wind-damaged roofs often appear to have been affected only in particular spots of the structure – the visual effect that this leaves is that the shingles have a crease from where it has been flipped over. 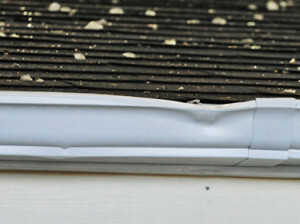 The perimeter or edges of the roof are easily affected by high winds in this way, as the edge of a roof is particularly vulnerable to lifting. The round dings in metal are obvious signs of hail damage. However, determining whether your roof has sustained damage from a hail storm may be a little more difficult. Once hail hits the roof, the protective granules are knocked off at the point of Hail Damage strike, and these damaged areas are the sources of roof leaks in the future, if the roof is not fixed within a few years. Although some damage from debris may be visible, during violent storms debris flying through the air can hit your roof, causing damage that you may not even notice. When a hard object hits your roof, it can break the fiberglass mat that is inside the shingle. Once that mat is broken and fiberglass shattered, the shingle will begin to deteriorate over time. 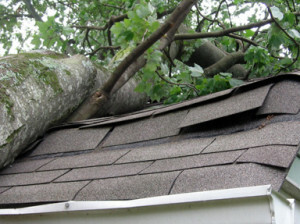 It’s important to have your roof inspected after any storm which has caused branches to break from trees or high wind to blow objects through the air. Snow mostly causes damage due to it’s weight, and that weight increases immensely when rain, ice and sleet are added to the mix. 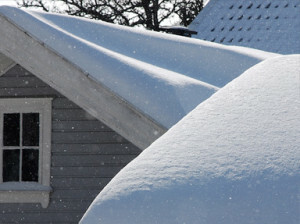 Two feet of snow on the average-sized roof can be the equivalent of 38,000 pounds, or 19 tons. Often, the obvious sign that a roof is about to give way is sagging. 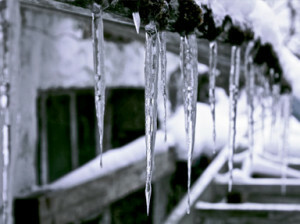 Each winter, the functionality of many roof and gutter systems are effected by fluctuating temperatures that cause snow to melt and then refreeze on the edge of the roof, creating a dam. Ice dams form a barrier that water cannot pass. This means that as more snow on the roof melts and trickles down, it gets blocked by the ice dam and forms a puddle. Since your roof wasn’t designed to handle standing water, especially as that puddle grows and the water line moves up the roof, the water can then seep through tiny openings in the roof and into your attic or home. It is extremely important that you hire the right company for the job. We frequently receive calls from homeowners who have been denied for roof replacement or have only been approved for a partial repair to their roof. While they most likely hired a good contractor who could complete the repairs, unfortunately the contractor did not understand the insurance claim process. CertiPro Restoration understands the insurance claim process, policy guidelines and how each individual insurance company evaluates and determines whether hail, wind or a severe storm has damaged your home. Certipro Restoration will walk you through the process to settle your insurance claim. Our process is efficient, timely and guarantees you the best possible result. 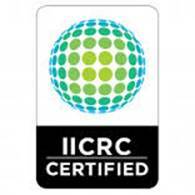 Each insurance carrier utilizes their own specific criteria that must be met, documented and verified—to determine if your roof and exterior of your home or commercial property should be repaired or replaced due to storm damage. We have worked with all of the insurance companies, and have a great understanding of how they will evaluate the damage. Our experts will help you understand these documented guidelines and verify whether your property suffered storm damage.